The DAY - is reserved for a full-DAY - optional tour to the Curonian Spit, a thin, 100 km stretch of land between the Baltic Sea and the Curonian Lagoon with small fishing villages, pine forests and endless sand dunes. Our first stop is the Hill of Witches in Juodkrante. After that we continue to Nida, where we visit the High Dunes, Thomas Mann's summerhouse and get acquainted with the charming resort town before we drive back to Klaipeda. The evening offers an optional Lithuanian dinner at Restaurant 19th Century. Klaipeda first became a part of Lithuania in 1923 and had a long history as a German town called Memel. A short sightseeing tour takes us to the Old Town with its narrow, cobblestone streets and old guild houses and we visit the Theatre Square and the Aennchen von Tharau Fountain. We now continue to the Samogitia National Park, where we embark on a walking tour around the picturesque Lake Plateliai. After that we continue to Siauliai and Cross Hills, one of the holiest sites of Catholic Lithuania. 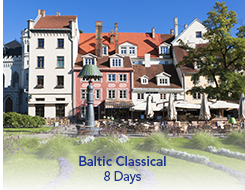 We head North into Latvia and reach Riga in the afternoon, check-in at Hotel Radisson Blu Latvija**** or similar. The evening offers an optional organ concert at the Dome Cathedral. Founded in 1201 by the German bishop Albert, Riga is the largest of the three Baltic capitals and boasts a true kaleidoscope of various architectural styles. The walking tour of the Old Town includes Riga Castle, Dome Cathedral, St. Peter's Church, Swedish Gates, Three Brothers, Large and Small Guild House and the Freedom Monument. The afternoon is reserved for an optional visit to Jurmala, the vibrant Latvian sea resort, famous for its wooden architecture and sandy beaches. In the evening enjoy an optional Latvian dinner at the stylish Restaurant Forest.